This site is under construction. All mistakes are mine, and so must the remedies be...unless you choose to edify me. Earth science (also known as geoscience, the geosciences or the Earth sciences), is an all-embracing term for the sciences related to the planet Earth. It is arguably a special case in planetary science, the Earth being the only known life-bearing planet. There are both reductionist and holistic approaches to Earth science. There are four major disciplines in earth sciences, namely geography, geology, geophysics and geodesy. These major disciplines use physics, chemistry, biology, chronology and mathematics to build a quantitative understanding of the principal areas or spheres of the Earth system. - Geology describes the rocky parts of the Earth's crust (or lithosphere) and its historic development. Major subdisciplines are mineralogy and petrology, geochemistry, geomorphology, paleontology, stratigraphy, structural geology, engineering geology and sedimentology. - Geophysics and Geodesy investigate the figure of the Earth, its reaction to forces and its magnetic and gravity fields. Geophysicists explore the Earth's core and mantle as well as the tectonic and seismic activity of the lithosphere. - Soil science covers the outermost layer of the Earth's crust that is subject to soil formation processes (or pedosphere). Major subdisciplines include edaphology and pedology. - Oceanography and hydrology (includes limnology) describe the marine and freshwater domains of the watery parts of the Earth (or hydrosphere). Major subdisciplines include hydrogeology and physical, chemical, and biological oceanography. - Glaciology covers the icy parts of the Earth (or cryosphere). - Atmospheric sciences cover the gaseous parts of the Earth (or atmosphere) between the surface and the exosphere (about 1000 km). Major subdisciplines are meteorology, climatology, atmospheric chemistry and atmospheric physics. - A very important linking sphere is the biosphere, the study of which is biology. The biosphere consists of all forms of life, from single-celled organisms to pine trees to people. The interactions of Earth's other spheres - lithosphere/geosphere, hydrosphere, atmosphere and/or cryosphere and pedosphere - create the conditions that can support life. Based on radio-dating of meteorites, the solar system is about 4600 Ma (4600 million years), or 4.6 billion years old (Ga). Formation of the solar system occurred 10 Ga after the Big Bang. The sun and planets condensed from a large, hot accretion disk. The sun's energy output has increased by 25-30% over the 4.6 billion years since the beginning of the Hadean. The Earth and Moon formed rather late in the accretion process, from a collision between a Mars-sized planetoid and a slightly larger body, and stratigraphy of the Hadean is known largely from lunar rocks. When early Earth was cooling from its molten state, conditions would have been like hell on Earth – hence the name Hadean for this earliest segment of the Precambrian. 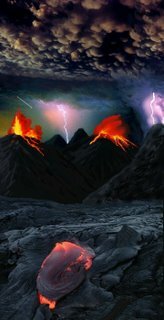 Meteors rained down on the hot Earth, ultraviolet radiation was unchecked by an ozone belt, and volcanoes belched fumes into a thin reducing atmosphere, which sparked with lightning. The planet was differentiating into layers, and the earliest thin crust was probably composed predominantly of ultramafic rocks and was not unstable because it was subject to comparatively rapid cycles of melting. Successive partial meltings of the crust generated intermediate and ultimately felsic magmas, which formed volcanic island arcs. Movement of crustal material was driven by convection and by the close of the Hadean plutonic activity and collisions between island arcs had created several continental nuclei. About 4.4-4.3 Ga, proto-oceans formed of water derived from volcanic outgassing and comets. With water came rain and erosion of igneous crustal rocks. Life, of course, had not yet evolved, but it may have had an earlier start than thought previously. Evidence indicates that life arose about 4 billion years ago, at the close of the Hadean Eon, and Cyanobacteria comprise the earliest known microfossils. The Cyanobacteria built large stromatolite reefs and dominated life for around 3 billion years (~4 Ga to ~1 Ga). 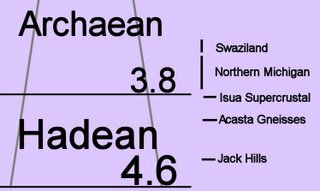 The atmosphere remained reducing for much of the Achaean, though Cyanobacteria began to generate oxygen after approximately 2.8 to 2.7 Ga. The term "hadean" was originally coined to designate the time before the earliest known rocks. However, rocks have been found that are older than the time-frame of the Hadean. 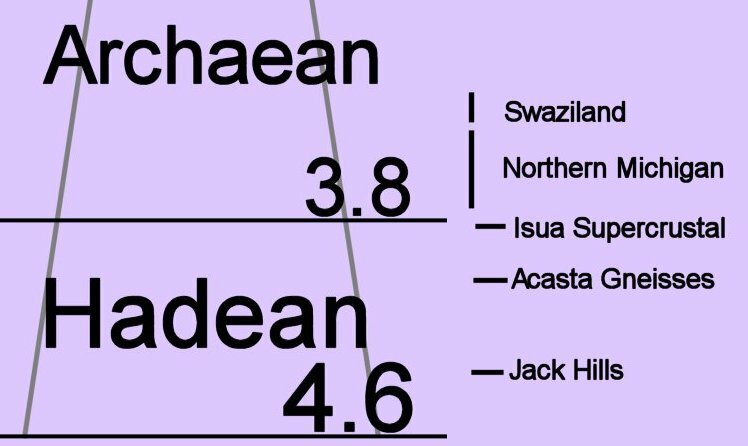 The Hadean Eon extends from Earth's formation until 3.8 billion years ago (Ga) and is succeeded by the Archean Eon (not to be confused with prokaryotic Archaea). The Archaean lasted until 2.5 Ga and was originally designated to commence with the then earliest known rocks, and hence to mark the beginning of geological history on Earth. However, the Hadean includes 4.4 billion year old detrital zircon from Australia and 4.03 billion year old gneisses in Canada. While 3.7-3.8 billion year old rocks from Greenland sit astride the designated Hadean-Archaean boundary. The Proterozoic Eon (inaccurately meaning pre-life) is the final Precambrian Eon and extends from 2.5 billion years ago to 540 million years ago. The Proterozoic is succeeded by the Phanerozoic ('visible life') Eon. Earliest evidence for the Yilgarn craton comprises zircon crystals found in the Jack Hills of the Narryer Gneiss Terrane, Western Australia and also 300 km. south. These earliest known zircons suggest continental crust formation existent around 4.4-4.3 Ga. The high Oxygen-18 values of 8.5 and micro-inclusions of SiO2 within these zircon crystals are consistent with growth from a granitic source supracrustal material, with low-temperature interactions and a liquid ocean. The Archaean, or Archean Eon extends from 3.8 billion years ago until 2.5 billion years ago. The Eon was formerly called the Archaeozoic, and is subdivided into Eoarchean (3.8-3.6 Ga), Paleoarchean (3.6-3.2 Ga), Mesoarchean (3.2-2.8 Ga), and Neoarchean (2.8-2.5 Ga) Eras or into early (to 3.3Ga), middle (to 2.9 Ga), and late Archaean. Life arose about 4 billion years ago, at the close of the Hadean Eon, and Cyanobacteria comprise the earliest known microfossils. The Cyanobacteria built large stromatolite reefs and dominated life for more than 2 billion years (~3.5 Ga to ~1 Ga). The atmosphere remained reducing for much of the Achaean, though Cyanobacteria began to generate oxygen after approximately 2.8 to 2.7 Ga.
Earth's heat flux during the Archaean was much higher than current levels: early in the Archaean the flux was almost triple current levels, while heat flows fell to twice current levels by the end of the Archaean. As a result of the high heat flow, the Earth had numerous hot spots, very active volcanoes, and rift valleys. Earth continued to experience bombardment by extrasolar debris plus the late heavy bombardment until 3.5 Ga. The majority of Archean rocks still in existence are crystalline cratonic remnants, which include unusual lavas (e.g., komatiite), intrusive igneous rocks such as great melt sheets, and voluminous plutonic masses of granite, diorite, ultramafic to mafic layered intrusions, anorthosites and monzonites known as sanukitoids. ● metamorphic alteration of felsic sedimentary rocks. Much continental material may have been lost if rocks were not sufficiently buoyant or were consumed at energetic subduction zones. Vaalbara is Earth's theorized first supercontinent, which, according to radiometric data, existed by 3.3 billion years ago (3.3 Ga) and possibly even as far back as 3.6 Ga. Geochronological and palaeomagnetic evidence suggests Valbaara began to break up ~2.8 Ga.
Ur was the first known continent, which probably formed 3 billion years ago in the early Archean Eon. By about 2.7 Ga, Neoarchean sanukitoid cratons plus new continental crust accreted to form another of Earth's earliest supercontinents, Kenorland. Two contrasting mechanisms have been proposed for Archean tectonics: “vertical tectonism” and “horizontal tectonism”. Vertical tectonism is attributed to density inversions inherent between denser volcanic sequences (greenstones) and underlying less dense sialic material (granitoids), which result in the buoyant rising of granitoids (diapirism) and sinking of greenstones (sagduction). Horizontal tectonism in the Archean is assumed to be similar (though probably not identical) to present-day plate tectonics, so is characterized by regional scale horizontal motion (drift) and resulting interactions of plates or microplates. Vertical tectonism can lead to local horizontal movement, and horizontal tectonism commonly results in vertical movement, as in collisional zones. However, regional scale horizontal displacements and regional scale strike-slip faults (or shear zones) cannot be explained by vertical tectonism and most likely results from horizontal tectonism. Vertical and horizontal tectonism were not necessarily mutually exclusive. The Archean mantle was hotter than the Earth's current interior, resulting in heavy mantle convection and crustal turbulence. Archean Earth was very active tectonically, with higher rates of volcanic activity and plate boundary movement than is occurring today. Active tectonics during the Archean created numerous, mobile protocontinental landmasses that floated on the turbulent mantle. Toward the end of the Archean, the proto-continents began to coalesce, and by about 3.3 Ga the more tectonically stable supercontinent Vaalbara is hypothesized to have formed by accretion of smaller landmasses. 70% of modern continental shields date from 3.0 to 2.5 billion years ago, which was the period of maximum continent formation. Most of the earliest rocks have been greatly altered through regional metamorphic processes, but later rocks (3.2-2.5 Ga) are mostly pillow-basalts that formed beneath the vast oceans. Archean sedimentary rocks are mostly coarse and poorly sorted sandstones and conglomerates. Vaalbara is Earth's theorized first supercontinent, which, according to radiometric data, existed by 3.3 billion years ago (3.3 Ga) and possibly even as far back as 3.6 Ga. Evidence includes geochronological and palaeomagnetic studies between the two Archaean cratons (protocontinents) called the Kaapvaal craton (the Kaapvaal province of South Africa) and the Pilbara craton (the Pilbara province of Western Australia). Further evidence is the structural sequence similarities of the greenstone belts and gneiss belts of the Kaapvaal and Pilbara cratons. These same Archaean greenstone belts are now spread out across the margins of the Superior craton of Canada and across the cratons of the former Gondwana and Laurasia continents. The subsequent drift paths of the Kaapvaal and Pilbara cratons after 2.8 Ga gives further evidence that they were once connected. It is not certain when Vaalbara began to break up, but geochronological and palaeomagnetic evidence show that the two cratons had a rotational 30 degree latitudinal separation at 2.78 to 2.77 Ga, implying that they were no longer contiguous after ~2.8 Ga.
Ur was the first known continent, which probably formed 3 billion years ago in the early Archean Eon. Ur joined with the continents Nena and Atlantica about one billion years ago to form the supercontinent Rodinia. Ur survived for a long time, until it was torn apart when the supercontinent Pangaea broke apart about 208 million years ago into Laurasia and Gondwanaland. Ur now forms parts of Africa, Australia, India, and Madagascar. In the early period of its existence, it was probably the only continent on Earth, and is so considered by some to be a supercontinent, even though it was probably smaller than Australia is now. By about 2.7 Ga, Neoarchean sanukitoid cratons plus new continental crust accreted to form another of Earth's earliest supercontinents, Kenorland, which comprised the Laurentia, Baltica, Australia, and Kalahari cratons. The Baltic/Fennoscandian Shield formed the core of Kenorland, with origins that trace back more than 3.1 Ga. The Yilgarn Craton (present-day Western Australia) contains 4.4 Ga detrital zircon elements. Protracted tectonic magna plume rifting occurred between 2.48 to 2.10 Ga, contributing to the break-up of Kenorland during the Late Neoarchaean and early Paleoproterozoic Era (2.48 to 2.10 Ga) during the Siderian and Rhyacian periods. The rifting is manifested by mafic dykes and sedimentary rift-basins and rift-margins on many continents. On early Earth, this type of bimodal deep mantle plume rifting was common in Archaean and Neoarchaean crust and continent formation. The geological time period remains conjectural at which Earth made the transition from deep-mantle-plume mechanism of continent formation to the current two-layer core-mantle plate tectonics convection mechanism that forms continents by subduction, convergence and accretion. However, with the findings of the earlier continent Ur and the ca. 3.1 Ga supercontinent Vaalbara, this transition period may have occurred much than the time of Kenorland. Paleomagnetic studies indicate that Kenorland lay in low latitudes until the rifting breakup commenced around 2.48 Ga. Paleomagnetic evidence further indicates that at 2.45 Ga the Baltic/Fennoscandian Shield, astride the equator, was attached to Laurentia (the Canadian Shield), forming a unity with both the Kola and Karelia cratons, which began to drift apart ~2.45 Ga. By 2.4 Ga, the Kola craton was located at ~15 degrees latitude and the Karelia craton had drifted to ~30 degrees latitude. Paleomagnetic evidence indicates that at 2.45 Ga the Yilgarn craton (now the bulk of Western Australia) was not connected to Fennoscandia-Laurentia and was located at ~70 degrees latitude. This suggests that Kenorland was no longer a supercontinent by 2.45 Ga. By 2.4 Ga, an ocean separated the formerly joined Kola and Karelia cratons. Based on the rift margin spatial arrangements of Laurentia, it is hypothesized that the Slave and Superior cratons were not part of the rifting supercontinent Kenorland, but may instead have been two different Neoarchaean landmasses (supercratons) located at opposite poles of a very large Kenorland. This speculation is based on the mechanics of how drifting assemblies of various constituent pieces should flow reasonably together toward the amalgamation of the new subsequent continent. The Slave and Superior cratons now constitute the NW and SE portions of the Canadian Shield, respectively. The breakup of Kenorland was contemporary with the 60 million year long Huronian glaciation. The banded iron formations (BIF) show their greatest extent at this period, indicating massive increase in oxygen build-up (estimated 0.1% to 1% of atmosphere). Rising oxygen levels caused virtual disappearance of the greenhouse gas methane, which was oxidized into carbon dioxide and water. The simultaneous breakup of Kenorland increased continental rainfall, increasing erosion and further reducing the other greenhouse gas carbon dioxide. This reduction in greenhouse gases coupled with solar output still less than 85% its current levels precipitated a runaway Snowball Earth scenario, when average temperatures planet-wide plummeted to below freezing. Despite the anoxia indicated by the BIF, photosynthesis continued, stabilizing climates at new levels during the second part of the Proterozoic Era. The Proterozoic Eon extends from 2.5 billion years ago to 540 million years ago. Pangea has been reconstructed on the basis of sea floor magnetic data. 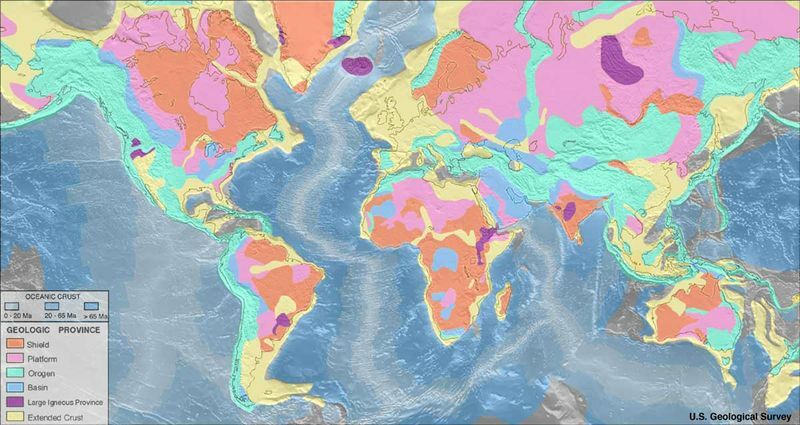 Gondwana has been reconstructed on the basis of paleomagnetic and biostratigraphic data, supported by geology. Debate continues regarding relative positions of continents within Rodinia, and the timing of assembly and breakup of Rodinia (some paleogeologists hypothesize the beginning of assembly as far back as 1.3 billion years). The configuration of Rodinia has been hypothetically reconstructed based upon paleomagnetic data and the mountain chains (orange) formed during the Grenville orogeny, which span several modern continents. The Phanerozoic Eon stretches from 543 million years ago, at the start of the Cambrian period, to the present. The classic opening of the Phanerozoic is marked by the appearance of trilobites and archaeocyatha, while fossil finds have pushed the first stratigraphic appearance of the 'small shelly fauna' back a few million years. Each era is further subidived into periods and epochs. A geologic province is an extensive region with distinctive geologic attributes that differentiate it from surrounding areas. A province may include a single dominant structural element (basin, fold belt) or a number of contiguous related elements. Adjoining provinces may be similar in structure but be considered separate due to differing histories. The continental crust is composed of lower density, more ancient felsic rocks of different composition than the mafic rocks of the oceanic crust, the oldest of which are about 180 million years old. Oceanic rocks arise in the oceanic ridge system (left - click to enlarge, hi-res). ∎ A shield is defined as an extensive area of very ancient rocks that have been exposed and levelled by erosion (peneplanation). The exposed Precambrian rocks of a shield are crystalline igneous and high-grade metamorphic rocks within tectonically stable areas lacking active orogenic belts. On a shield the (usually) Precambrian basement rocks of the craton crop out extensively at the surface. A craton is an extensive portion of a continental plate that has remained relatively undisturbed since the Precambrian era, and includes both shield and platform layers. ∎ A platform is that portion of a continent that is covered by horizontal or gently tilted rock and is underlain by very ancient rocks of the crystalline basement. The ancient bedrock was consolidated during deformations that preceded deposition of the sedimentary rocks of the overlying platform layer. ∎ An orogenic belt is that part of the continent where deformation of the Earth’s crust created a mountain range, which may since have eroded down to the roots of the original mountains. Because shield areas have been little affected by any tectonic events since the Precambrian, they are relatively flat regions in which mountain building, faulting, and other tectonic processes are greatly diminished compared to the activity occuring at shield margins and at the boundaries between tectonic plates. Because of their stability, shields have been flattened by erosion; however, shields commonly have a very gently convex surface and are surrounded by sediment covered platforms. Together, the shield, platform and basement comprise the craton. Shields are very complex, comprising vast areas of granitic or granodioritic gneisses, usually of tonalitic composition. They contain belts of sedimentary rocks, often surrounded by low-grade volcano-sedimentary greenstone belt sequences containing metamorphosed greenschist, amphibolite, and granulite facies. The marginal areas of stable shields often display complex orogenic sequences occuring during the past few hundred million years. Shield margins generally exhibit tectonic or plate-like dynamic mechanisms. Shields form the nucleus of most continents and typically are bordered by orogenic belts of folded Cambrian rocks. Continents have expanded through accretion of younger rocks that have undergone deformations through successions of mountain building episodes. Thus, belts of folded rocks were welded onto the borders of the preexisting shields, increasing the area of proto-continents. The margins of shield are subjected to geotectonic forces that remodel the cratons that they partially comprise. ∎ A structural basin is a large-scale formation of rock strata deformed by tectonic warping of previously flat lying strata. Structural basins have affinities with geological depressions, but are distinct from sedimentary basins in which time-dependant aggregation of rocks has in-filled a depression or accumulated within an area. Downwarped strata form synclines, which are concave geological folds, with layers that dip downward toward the center of the structure. Basins can develop through greater erosion of the fractured, upwarped rocks at the center of an anticline, such that strata that originally lay at the top of the dome are eroded most. Such structural basins are the inverse of domes, which are symmetrically-dipping anticlines. Because a structural basin's strata dip toward the center, the exposed strata in a basin have the youngest rocks in the center. Oceanic basins commence at continental shorelines, but each continent extends under the adjacent ocean. The continental shelf (or continental platform) comprises the extension of a continent under an ocean. A continental shelf is characterized by a very gentle slope and generally reaches depths of less than 200 metres, at which point there is a steep slope down to the ocean floor.